Animation: Sonic the Hedgehog (SatAM) episode "Heads or Tails"
Someone who lost an argument with a Roboticizer [::laughs nervously::] All kidding aside, she's one of the Freeedom Fighters in Knothole Village. Bunnie is loyal, brave, and quite a -flirt- sometimes ;) She seems to have a talent for "looking on the bright side", in spite of all the stuff she's been through. The alteration to her "cute li' ol' bod" gets her down sometimes (most notably in Sonic Conversion), but she deals with it--and uses it to help her friends. Her perkiness may be her way of keeping things from depressing her, but I'd say it's just part of her (charming) personality. Although it was never said explicitly in the show (but -was- in the comics), it is implied (from her accent) that Bunnie is from Southern Mobius. Thanks to Christine Cavanaugh, Bunnie's accent was charming, not lame, in the show (unlike that of some other "Southern" characters ;D). However, some of the writers at Archie Comics (pay attention, Mike Gallagher!) get a little cheesy with it while scripting her. That depends on who's writing the story ;) Her robotic legs are extendable (maximum length is unknown) and her robotic left arm comes in handy for "door removal". In the comics, she also has jets in her feet which allow her to fly. During the "Mecha Madness" story arc, Rotor equipped her with quite an arsenal, including an energy shield and a (electro-magnetic) pulse cannon. I assume these were temporary because she never used those items since then. Also, there's the matter of her "upgrade" in Sonic Super Special #11--but that opens up a completely new (proverbial) can of worms. So, how come she's part robot? The other version is from the book Robotnik's Revenge (written by Michael Teitelbaum, published by Troll Associates), in which Bunnie (who was with the Freedom Fighters from the beginning) was captured by Robotnik and used as bait in a trap for Sonic. The trap failed and the nasty Doc activated the Roboticizer--with Bunnie still in it! Sonic wrecked the Roboticizer, picked up Bunnie, and juiced for Knothole. This version seems more believable (at least to me). As for the animated series, this was never explained. What the hoo-hah did you mean about an "upgrade"?! "Upgrade" was the title of one of the stories in Sonic Super Special #11. Dan Drazen has written an excellent review of this issue--I recommend grabbing a copy of it from his Sonic site. I also have scans from the story in my image collection, so you can see for yourself. Um, okay--so what's with the parenthesis? Hmm? Oh, the ones in the heading. Well, in the animated series (as opposed to the comic) I don't ever recall _any_ of the Freedom Fighters (including Bunnie) refer to her as "Bunnie Rabbot". They just called her "Bunnie" (well, Tails once called her "Aunt Bunnie", but I digress). On the other hand, Robotnik and Snively _always_ called her "Bunnie Rabbot". Therefore, I think the "Rabbot" part is a description, NOT part of her name. Afterall, she isn't completely a robot or a rabbit--she's something in between. Robotnik's Revenge supports this by introducing her as "Bunnie Rabbit" [::waits for laughing/groaning to stop::]. At the end of that story, Sonic himself suggests "Rabbot" for her new lastname. Well, she does amuse me with her "come back" lines and I laugh (or groan) when she drops an occasional pun (this happens more in the comics, though). What's even cooler than her come back lines is Bunnie's ability to "come back" in a fight. One minute you think she's out of a fight, the next she's jumping back into the fray! She just keeps comin' back for more! The only way to take her out of a fight is to knock her out cold! Good question. 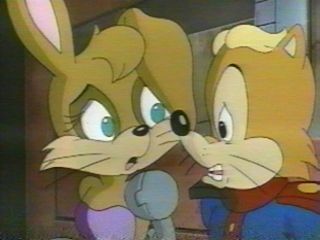 In the animated series, Bunnie seemed to be annoyed with Antione most of the time. Yet, when Antione asked if she’d teach him martial arts (in Fed Up With Antoine), Bunnie gave him the benefit of the doubt and agreed to teach him (she ended up ticked off at him, though). Did anyone notice that when Antoine "mis-speaks", everyone corrects him--except Bunnie? She either ignores it (in an "uh-huh, sure" kinda way) or she’d (occasionally) throw it back at him. For example, there was a scene in Harmonic Sonic in which Bunnie & Antoine were using a pulley system to raise a rocket (in order to launch it). Antoine: "..I will be pulling a casket!" Bunnie: "If anyone pulls a casket around here, it’ll be me! Ah’m doing all th’ work, Antoine!" 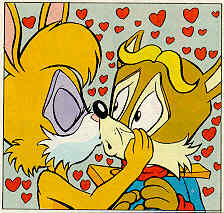 In issue #46 of Archie Comic's Sonic the Hedgehog series, Bunnie seemed to be in love with Antoine(?!?). I should have seen this coming (afterall, it's been done in fan fiction), but it caught me by surprise. If there had been a little build-up to this revelation, it wouldn't have been such a shock . However, the fact remians that there wasn't (unless you count Angelo's story "Vol-Ant-eer" waaaay back in StH #23). I've had reservations about Bunnie & Antoine "being an item" at first, but it seems to work--especially if you realize that -this- version of Antoine is quite different from the SatAM one. Only time will tell where this development will lead. It could provide great character development---or a great potential to foul up! "Bunnie's Worst Nightmare" (or Rich Koslowski shows off) That was the title of a solo story that ran in Sonic The Hedgehog #37. Note my subtitle for it; this isn't meant in a nasty way. Sure, we knew Rich could draw/ink (well I like his style)--but in addition to "showing off" his artistic talents with this story, he also "shows off" his understanding of his favorite Freedom Fighter. His scenario combined three of Bunnie's worst fears: becoming completely Roboticized, being rendered helpless (i.e. being in a situation that she can't do anything about), and becoming a threat to her friends. The plot goes something like this; Bunnie discovers that her robotic parts are replicating and slowly turning the rest of her robotic. Rotor tries to stop to process, but is not successful. 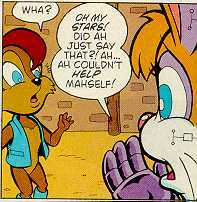 While the Freedom Fighters discuss their options, Bunnie briefly behaves like a badnik (click here for that panel). This shocks her so badly (view panel), she decides to leave Knothole (yet another panel). Of course, as the title implies, it was all a very bad dream. Even so, seeing Bunnie as a 'bot was kinda eerie (Well, I thought so...check out the image to the right). Several Sonic stories resort to "Deus ex Machina" or have plot holes that are big enough to drive a bus through--and quite a few seem to involve Bunnie. For my first example, I shall pick on a story in StH #9. Puns ran rampant in "Pseudo-Sonic", but that's not what I'm complaining about in -this- rant. Basically, the story went like this: Sonic gets a mondo rash from some uncool sumac and it leaves him in a bad (and disgusting) way. Meanwhile, Robotnik's newest creation, Pseudo-Sonic, infiltrates the Freedom Fighters. Tails stops it from giving out their location to 'buttnik, but that doesn't keep Robotnik from trying to track them. The Doc spots a certain blue hedgehog who is too spent to spin. Okay, check your brain at the door now--Bunnie appears (from out of nowhere) and shoots Robotnik out of the sky. Yes, shoots! Gee, Mike, I never knew she had a "gun mode" for her robotic arm! :D Anyway, she then picks up Robotnik (But he's not her type! *Chuckle* Sorry; I couldn't resist.) and sends him bouncing back to Robotown. Sonic drops some more puns (Pick those up! Someone might trip over them!). Then Bunnie deals with Sonic's rash by squirting some of "Aunt Lulumae's Oinment" (Am I missing some sort of joke here?) out of her finger. (I have a handfull of finger puns, but I shall refrain from using them.) Um, you really don't -want- to know what Bunnie said was in the ointment, do ya? Oh, yeah; the story concludes with Rotor taking out the trash--which contains Pseudo-Sonic parts. The Saturday morning episodes were not immune to this either. In Sonic Racer, Antoine tripped--thus activating the conveyor belt on which he was standing. Bunnie grabbed the belt and yanked on it in an attempt to keep Antoine from becoming ground fox. Sally fired a flare to signal Sonic, who decided that bailing his buds out of trouble was more important than winning the race. When I first saw that episode I thought, "Why the _heck_ didn't Bunnie just grab the lever and shut off the darn conveyor belt? Or even rip out the gears that were turning it?" The answer, I suppose, is "so Sonic can save the day like a good little hero". 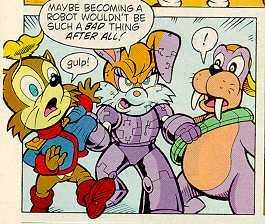 That might also explain why Rotor and Bunnie just _stood_ there while Snively used the memory scrambler on Dulcy in No Brainer. In my (not so) humble opinion, it was out of character for them to do that. They would have at least _attempted_ to rush Snively while his attention was focused on Knothole's resident dragon. Bunnie has her good points, too. She's pleasant to her friends, yet fierce to her foes! She's selfless--puts the good of others ahead of her own saftey (sometimes to a fault--the episode Super Sonic and issue #39 of StH are good examples of this). She is quite opinionated; Bunnie has an opinion on just about everything and she's not afraid to voice it. Her opinions are sometimes quite entertaining, too. Hmm...perhaps her -faults- are the true reason I like her; they make her more "believable" than Sally, thus making easier to relate to. Send me e-mail at mokat01@lycos.com with Bunnie or Sonic Rants in the Subject line (so I'll know it's not spam).